Tired of getting left behind by higher-authority competition? You need a digital marketing agency that helps you dominate your competition and turn your business into a digital powerhouse. We create custom digital marketing strategies that build authority into your entire web presence. With a seasoned pit crew of digital marketing experts behind you, you'll become the champion you deserve to be. How Do You Want to Accelerate Your Business Performance? Learn which services will get your site found and bring in targeted traffic ripe for conversion. From email signups to increased sales, these services can blow up your conversion rates. If you want business growth (and who doesn't), these are the digital marketing services you need. Make your online ads work harder for your company and deliver killer results with these services. Get more potential customers in your sales funnel with any of these several services. Be the one web searchers look for when they have a need for your products and services. 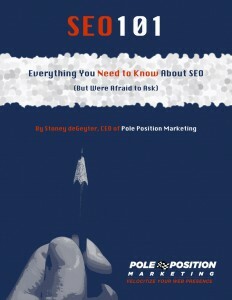 In addition to being the main writer on Pole Position Marketing’s E-Marketing Performance blog, Stoney is a regular contributor to top web marketing industry blogs. Stoney's blog posts are full of industry insight and actionable tips. 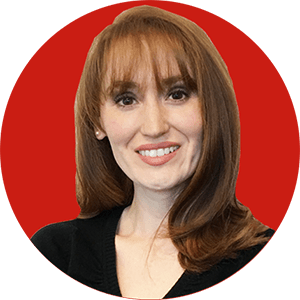 Stoney has presented at world-class digital marketing conferences, including Pubcon, Search Engine Strategies and Search Marketing Expo, as well as marketing organizations and local business workshops across North America. Stoney wrote the book on web marketing. Literally! In The Best Damn Web Marketing Checklist, Period!, Stoney boils down his digital marketing expertise into 36 checklists that take you step by step through 600+ action points. A pit crew's job is to get drivers back on the track as quickly as possible, running at peak performance. They achieve this goal through hyper specialization, each member working on a different part of the vehicle at the same time. Substitute "web presence" for "vehicle," and you begin to see how Pole Position Marketing's pit crew operates. You won't find any "jack of all trades" here. Instead, you'll work with a team of experienced strategists, each with a deep understanding of a specific digital marketing discipline. Each strategist spends a minimum of five hours a week keeping up-to-date on their craft. By having a master of each trade working on your web marketing strategy, we put you on the fast track to digital marketing success. Our digital marketing strategies are customized to your specific needs and goals. That’s why it all starts with a site audit. We offer seven unique site audits covering the most vital components of web marketing. Each audit will provide you with an in-depth review and a list of actionable recommendations designed to boost the metrics that will grow your business. Analytics can tell you a lot about your online performance, but only if you know how to interpret the data. We do that for you in an Analytics Audit, giving you actionable insights to increase conversions, improve visitor loyalty, make campaigns more efficient and more. Behind-the-scenes issues, such as broken links, duplicate content, and ineffective or non-existent SEO optimization, could be killing your website’s search engine performance right out of the gate. An SEO and Website Architecture Audit will help you find and fix these hidden problems that are getting in the way of your online success. Are your social media efforts effective at building your brand awareness, reputation and traffic? Use a Social Media Audit to find out and make sure the time you spend on social media isn’t wasted. Content is the lifeblood of your website—is yours falling short? A Content Messaging Audit will show you where your content is failing to convince and convert website visitors. Are you successfully driving traffic to your website but failing to convert visitors into customers? A Conversion and Usability Audit can tell you why, highlighting areas of your site that may be frustrating or confusing your site visitors enough that they jump ship. When local customers are looking for the products or services you sell, you want to make sure they find you. If your website isn’t optimized for local SEO, you could be missing out on a lot of opportunities. Our Local SEO Audit ensures that search engines can correctly identify your location and local information so that you appear in local search results. We break down the areas that impact pay-per-click advertising ROI. There is an endless supply of digital marketing agencies or "SEOs" who will promise you the moon—or top search engine rankings—using the newest, cutting-edge techniques. Sorry, we won't promise you the #1 spot in Google. What we WILL promise is that we'll apply techniques that are proven to bring long-term growth, not fly-by-night strategies that only provide short-term gains. Pole Position Marketing has managed Mercy Medical Center's AdWords account for more than three years, and our team has been very pleased with the number of leads our campaign generates. Even though our account is small by comparison, the pros at Pole Position deliver consistent attention and responsiveness to the hospital's marketing needs. We also appreciate the integrity with which Pole Position operates. No hidden fees. No meaningless stats. Just clear explanations and consistent leads that are in line with our budget. Pole Position has been a great partner for me being a one-woman marketing department. They have devoted a lot of time to understanding our business and make remarkable recommendations for not just increasing traffic to our website, but increasing QUALIFIED, CONVERTIBLE traffic to our site. The entire team is brilliant, responsive and awesome to work with! Thank you for everything. Over the past seven years, Pole Position Marketing has been instrumental in bringing Sierra's lead generation and online marketing to a new level. Their SEO expertise is always on point, keeping up with the latest search trends, and has consistently placed Sierra in the top 5 search results in Google. PPM also manages our PPC campaigns which are highly targeted and refined, giving us very strong leads and conversion rates. What's even more important than our excellent results is the terrific team at PPM. All the team members at PPM are domain experts, very proactive, take initiative, and always give us just the right advice to push our results to the next level. The team is a pleasure to work with. After only 7 months with Pole Position Marketing and a very modest budget we almost tripled the number of hits on our website and have had just over a 100% increase in our sales. Stoney and his crew are very helpful and professional. Thank you guys for everything. Pole Position Web has been our SEO company for [many] years and has been doing a great job. We have many phrases that are number one on Google and many of the major search engines. ROI is definitely there. Thank you very much for all your hard work. We are on the 1st page in Google. This is great! We signed up with Pole Position to be our SEO 3 years ago when we barely had any traffic to our web site and our business was in trouble. Pole Position stepped in and did their magic. Within a few months, we were ranking high on the major search engines. The amount of inquiries that came in were astounding. Our business picked up to a momentum where we had to turn clients away and recommend other wedding companies to them. We made the best business investment we could ever make by hiring Pole Position to be our SEO. You helped me obtain our 5 year plan in just 13 months. We could never have done this without your help!!! Pole Position has met and far exceeded my expected results. Their knowledge of Internet marketing, responsiveness, performance and cost effectiveness have made this skeptical client a firm believer. The team at Pole Position has been great, making our web changes a breeze, and our site stays on top of all the major search engines. I would recommend this team for any type of Web Maintenance…! Thanks Stoney and team. We make sure they find your products and services instead of your competitors.